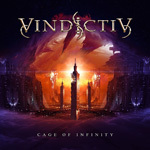 Prepare for a change in direction, perhaps even a curve ball thrown your way, with the latest from Swedish guitarist Stefan Lindholm's Vindictiv project, Cage of Infinity. Gone are the melodic and progressive metal themes of previous albums. Instead, Lindholm brings in your face, smash mouth, heavy metal. What does remain the same is each song being a platform for his skillful neo-classical guitar widdling. And I'm not sure I like the new Vindictiv sound, mostly because every song is just that: heavier metal and guitar fireworks. It's probably not fair to say that the 'melodic' metal current is gone as I can't imagine Lindholm ever abandoning that significant element. Good examples come with Human Emergency or Astronaut. But, overall, it gets a pretty good clubbing thanks to the heavy metal. Additionally, Vindictiv has a new vocalist with Marco Sandron (Pathosray, Fairyland, ex-Eden's Curse) replacing Goran Edman. Big shoes to fill and Sandron does well, but when listen to a song like The Chosen, the heaviness is giving him a beat down too. Give Lindholm extra marks for having the courage and creativity to take a new direction. Otherwise, I'll wait to see what's on the next album. Give Lindholm extra marks for having the courage and creativity to take a new direction, delivering smash mouth heavy metal as a platform for his skillful neo-classical guitar work.